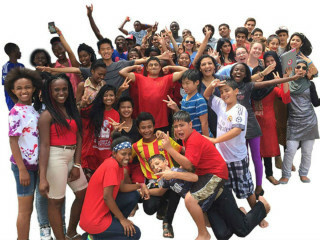 PAIR Houston is a local 501(c)3 nonprofit organization whose mission is to empower refugee youth to navigate American society, reach their academic potential, and become community leaders through educational mentoring programs. The organization will host a screening of Pushing the Elephant to learn about refugee resettlement, PAIR's programs, and hear from students who have experienced both sides of the narrative. Pushing the Elephant tells the extraordinary story of a mother and daughter reunited after a decade separated by civil war. In the late 1990s, Rose Mapendo lost everything to the violence that engulfed the Democratic Republic of Congo. She emerged from the suffering advocating peace and reconciliation. But after helping numerous victims to rebuild their lives, there is one person Rose must still teach to forgive - her daughter, Nangabire. Following the film, local refugee students and a volunteer from PAIR's programs will share a few words.